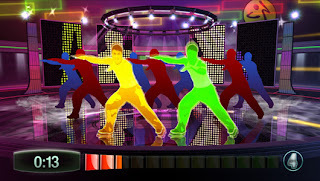 Zumba Fitness uses the motion sensing capabilities of the Wii Remote or Wii Remote Plus controller to bring steamy, calorie-burning moves to the TV screen. 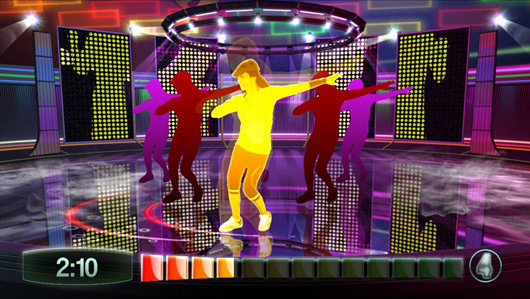 The game's primary play mechanic is the replication by the player(s) in real-time of body moves that are demonstrated by an on-screen virtual instructor. The core-centric nature of these moves means that gameplay for each player requires only one controller, which is enclosed in the exclusive Wii Remote belt included with the game. (The belt is also compatible with the Wii Remote Plus controller) On-screen color changes to a representation of the player in-game alerts you to the accuracy of your moves, while a countdown clock keeps you constantly updated on the time remaining in the routine. Zumba Fitness also includes fan favorite Zumba instructors Tanya, Gina and Zumba's creator Beto, who together guide you through more than 30 routines that will make you forget you are even exercising. Together with four-player support allowing a friends join in the workout and an ever-present, infectious Latin groove, players have all that they need to dance the weight off and have a blast doing it. Bring the Zumba Fitness experience home with you in the first interactive game based on the successful brand. Learn and perfect nine different dance styles: Reggaeton, Merengue, Salsa, Cumbia, Hip-Hop, Mambo, Rumba, Flamenco and Calypso. Includes more than 30 Zumba routines - some exclusive to the game. Follow your on-screen Zumba instructor’s routine in a high voltage party atmosphere. As you fine tune the steps, the stage and party transforms in dynamic new ways. Strap the Zumba belt to your waist to turn the Wii Remote into a hip motion sensor. Supports up to 4 players as you team up and try to earn the highest workout score as a group or play against each other in Zumba Attack! Mode for the ultimate fitness dance off. 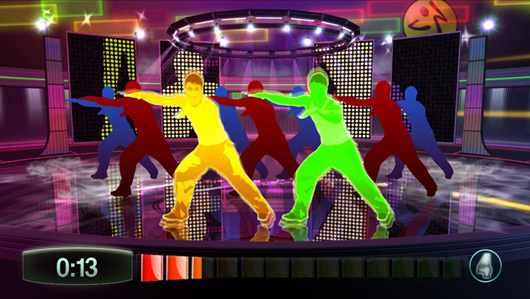 Dance in a range of venues: learn the basics in the Zumba gym and then take the party to a fantasy night club, an industrial factory, a skyscraper rooftop and a futuristic Zumbathon stadium. Includes "Learn the Steps" training, Beginner, Intermediate and Advanced routines for all skill levels. Dance steps learned can be taken with you if you attend a real Zumba class or on the dance floor at your next party. Having had the opportunity to try out a Zumba Fitness DVD a while back, I was excited to check out the Zumba Fitness on our Wii! I admittedly have issues with rhythm (my dancing skills are beyond lacking) and in addition to losing inches and getting myself in better shape, I would also love to gain some new moves in the process! By simply placing the Wii remote into the included belt (with Velcro closure) your movements are tracked, and you can earn points to essentially "win"....but your winning either way in my opinion, as your working out & getting into shape! Zumba Fitness for Nintendo Wii is a BLAST! I am having so much fun dancing the pounds & inches off! Fitness + FUN, can't ask for more than that! Join the Party! 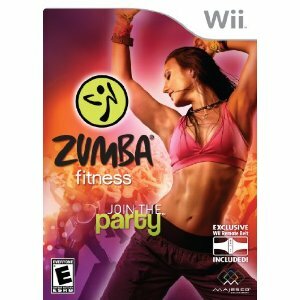 One Lucky Reader will receive a copy of Zumba Fittness for Nintendo Wii! Leave a comment~ Let me know why your excited to try Zumba Fitness! The comment is considered your enty. Entry to this giveaway ends at 12pm PST March 9, 2011. Winner's are chosen randomly through random.org. The winner will be announced in a post within 7 days of the giveaway ending, and contacted through email. The winner will have 48 hrs. to respond or another winner will be chosen. I'm excited to try it because I know Zumba is really fun and the music gets you going. I would love to try the Zumba workout. Everyone around here does it but I don't have the time to go to a class. This would be perfect. I can't wait to try Zumba for the Wii! I've been going to Zumba classes at my local gym for 5 months now and I LOVE it! I have lost weight and inches and it's so fun I don't even realize I'm exercising!! I am an at-home fitness exerciser. It can't seem to get time to go the gym with two kids. I have a wii and this would be perfect for me! Plus, I could use some practice in the rythem dept too. I suffer from a rare genetic disease called Porphyria and my doc and physical therapist recommend that I try to build my body up by doing Zumba. I didn't realize there was a Zumba for wii so I would love to win this! I would love to try it because I have just started a local Zumba class and I love it but I don't always have time to go. This would help me keep it up! I love ZUMBA I took a class at our local YMCA It is FUN and really gets you moving! I'd like to try Zumba because it looks so fun! My friend was telling me about this and wanted to actually go to a class. Im not the type of person to be doing activity like this with a crowd. This would be perfect in the comfort of my own home with no watchers. I've always wanted to try Zumba, but been too nervous to try out at a studio. This game would be awesome. Second Round of Tweets for today!